In the West, both scholars and ordinary people are curious about China’s perspective on the Iran nuclear issue. I have followed the debates over Iran’s nuclear program for more than eight years and can provide some insight as to China’s stance. To be honest, the average Chinese person is not overly concerned about the Iran nuclear issue for two reasons. First, Iran is relatively far away from China and the two countries have few cooperative activities. Meanwhile, there are many topics closer to home that attract the attention of Chinese people: the North Korean nuclear issue, the dispute between China and Japan over the Diaoyu Islands, disputes between China and ASEAN countries over territories in the South China Sea, and the strategic chess match between China and the United States in the Asia-Pacific region. Accordingly, the issue of Iran has not been one of the top five international issues in the eyes of the average Chinese. Second, over the past few decades, China has paid insufficient attention to its diplomacy with the Middle East. Iran in particular has never been considered as one of the top three targets of diplomacy by the Chinese Ministry of Foreign Affairs. To provide an interesting example, at the same time that the international community and Iran were holding talks in Geneva, the Third Plenum of the 18th Communist Party of China Central Committee was going on in Beijing. Although the United States, France, Russia and other major powers sent ministers to attend the Geneva talks, Wang Yi, the Chinese Foreign Minister, stayed in Beijing due to his responsibilities as a member of the Central Committee. China only sent other senior diplomats to attend the meeting alongside the great powers’ foreign ministers. This discrepancy reflects China’s role in the Iran nuclear issue. I would argue that although China hasn’t been a strong voice on the Iran nuclear issue, it is one of the beneficiaries. For example, when Western countries imposed sanctions against Iran due to concerns over its nuclear program, Chinese oil companies were able to win bids for developing large oil fields in Iran. While others seek a solution for the Iran nuclear issue, China is able to attempt to secure its own national interests. It should be noted that, after the Third Plenum, China increased its attention to the negotiations over Iran’s nuclear program. China has been sending higher-level officials to participate. After the Third Plenum ended, China’s Vice Foreign Minister Li Baodong led a delegation to participate in the ongoing negotiations. Though not the Foreign Minister, Li Baodong previously served as the Chinese ambassador to the UN and was present when the UN passed resolutions declaring sanctions against Iran. Li is very familiar with the Iranian nuclear issue, and is a suitable candidate for the talks in terms of both ability and rank. In another sign of increased Chinese interest, China and Iran have had frequent interactions recently. Iran’s new president Hassan Rouhani held in-depth meetings with Chinese President Xi Jinping at the Shanghai Cooperation Organization Summit. Iran’s influential Speaker Ali Larijani just visited China, where he agreed to strengthen cooperation with China in oil and other fields. These high-level exchanges between China and Iran best represent the countries’ intention to further develop the bilateral relationship as well as Iran’s approval of China’s position on the Iranian nuclear issue. In fact, President Hassan Rouhani took the initiative to discuss the nuclear issue with Xi Jinping, which was unprecedented. 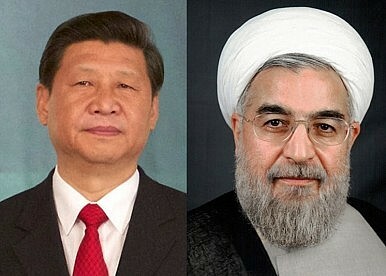 The move showed that Rouhani values China’s role in the talks. It also proves that China is becoming increasingly proactive on the Iranian nuclear issue. According to official statements, China’s position on Iran is as follows: First, “Iran is entitled to peaceful use of nuclear energy, and should honor its international obligations.” Second, “Final settlement of the Iran nuclear issue should depend on dialogue, negotiation and other means of cooperation.” Third, “China does not favor unilateral sanctions against Iran.” In a nutshell, China believes the following: Iran may carry out limited uranium enrichment activities, the Iranian nuclear issue should not lead to war, and the unilateral sanctions by Western countries on Iranian oil and other products have affected China’s interests. In other words, avoiding war and ensuring energy security are China’s fundamental interests when it comes to Iran. China recently held a high-level meeting devoted to “peripheral diplomacy.” Although Iran is not a peripheral neighbor of China, it can be seen as China’s “great neighbor”. This “great neighbor” concept applies to countries not bordering on China, but that share important political, economic, and other strategic interests with China. Such countries are priorities for China’s “great neighbor diplomacy” (as long as they are not too far away from China). China could implement “great neighbor diplomacy” with Iran by relying on the “New Silk Road Economic Zone,” a concept presented by Xi Jinping during his September visit to Central Asia. This economic belt is conceived of as starting along the Pacific coast in the east and running to the Baltic Sea in the west, thus connecting China, Central Asia, Afghanistan, Pakistan, Iran, Russia and even Eastern Europe. Iran is an important node on the economic belt. In the future, this could mean that exchanges between China and Iran in energy and other aspects will be even smoother. Of course, these plans are dependent on the easing of tensions in Iran, including a balanced solution for the Iran nuclear issue. Because of China’s plans for this major international cooperative zone, it’s natural for China to hold fast to its anti-war stance on the Iran nuclear issue and safeguard its bottom line to ensure energy security. Western media speculated that an agreement over the Iran nuclear issue might take two steps. First, Iran will be allowed to carry out limited uranium enrichment activities during a transition period, while Western countries begin to ease sanctions. Second, at the end of the transition period, Iran’s uranium enrichment plan should be put under international supervision, making it absolutely impossible for Iran to produce nuclear weapons, and Western sanctions will be gradually relieved. The actual deal, as described by The Diplomat’s Zachary Keck and Ankit Panda, does include these elements. This “ice-breaking” resolution on the Iranian nuclear issue reflects China’s basic position and fully satisfies China’s national interests. Over the years, China’s role in the negotiation process with Iran has been overshadowed by the Western powers and Russia. While China’s part has been vague, this actually means that China profits most from the final result. China has achieved its interests with little diplomatic effort. In particular, China has repeatedly stressed the avoidance of war, which has been fully realized so far. Iran and the West have moved beyond the tense, Cold War-like atmosphere of the Ahmadinejad era. Now engagement and dialogue are the guiding actions for the various parties. Unlike some hawkish Western politicians, China has always firmly opposed war, as conflict between the West and Iran could have a tremendous impact on China’s energy security. China’s anti-war stance abets Iran’s friendly attitude towards China and strengthens Iran’s energy cooperation with China. This is enough to safeguard China’s energy interests in Iran. The recent negotiations over the Iran nuclear issue have ensured desirable results for China. By contrast, it seems impossible for Western countries to completely stop Iran’s uranium enrichment, much less overthrow the Iranian regime. But it’s very likely that the Iranian nuclear program could be put under international supervision. As a result, we may come to the basic conclusion that an agreement on the Iranian nuclear issue will benefit all parties — and China will profit the most. Mu Chunshan is a Beijing-based journalist. Examining Crime and Terrorism Along China’s Belt and RoadChina’s Rise in the Middle East: Beyond EconomicsChina in the Middle East: Past, Present, and FutureChina’s Crisis of OverconfidenceWhat Does Iran Really Think of China?